I think it’s time for some dessert, don’t you? My daughter asked me to make strawberry tarts – I’ve never made them before so I’m not sure where she got this idea into her head, but I’m glad she did! I found this excellent recipe by Ina Garten but modified it a tiny bit. For starters, I had extra pie dough in the freezer so I used that in place of the pastry that Ina recommends and I also used my own pastry cream recipe, which is very similar to Ina’s. I omitted the liquor to make the recipe kid-friendly and I also added a layer of melted chocolate under the pastry cream to both add flavor and to prevent the crust from getting soggy after the pastry cream was added. . 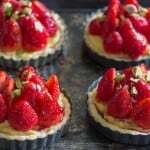 I love the color that the pistachios add to these tarts and the salty sweet combination is one of my favorites. 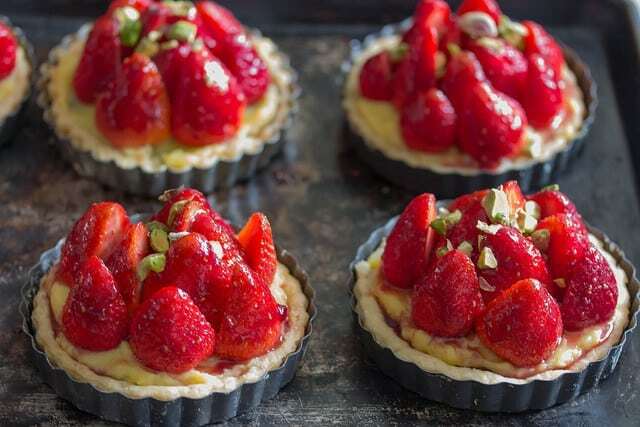 Arrange strawberries on top of pastry cream, brush with jam, and top with pistachios if desired.